Bushra Ilyas, a PhD student in the Coombes lab, is the first author of the study. Comparing two strains of Salmonella – one that causes disease in humans and the other in reptiles – researchers discovered a covert way that the human-affecting bacteria essentially tricks the immune system into not attacking. The findings were published Oct. 23 in the journal Cell Reports. “The immune system is very efficient at what it does, but if bacteria evolve ways to get around it, the immune response becomes ineffective,” said Brian Coombes, a professor in the Department of Biochemistry and Biomedical Sciences at McMaster and Canada Research Chair in Infectious Disease Pathogenesis. “What we found was that Salmonella Typhimurium has a mechanism wired into their genome that shuts down the expression of flagella once it contacts a host cell,” said Coombes, who is part of McMaster’s Institute for Infectious Disease Research. Brian Coombes in his lab at McMaster University. The Coombes lab is building on these findings by searching for new ways to bolster the immune system. Coombes noted that understanding how bacteria become harmful assists McMaster University’s research focus on helping address the looming antibiotic resistance crisis. Read the Brighter World profile on researcher Brian Coombes here. McMaster University researchers have found a new way bacteria evade the human immune system and promote infection. Comparing two strains of <em>Salmonella</em> – one that causes disease in humans and the other in reptiles – researchers discovered a covert way that the human-affecting bacteria essentially tricks the immune system into not attacking. The findings were published Oct. 23 in the journal <em>Cell Reports</em>. “The immune system is very efficient at what it does, but if bacteria evolve ways to get around it, the immune response becomes ineffective,” said Brian Coombes, a professor in the Department of Biochemistry and Biomedical Sciences at McMaster and Canada Research Chair in Infectious Disease Pathogenesis. His research team compared <em>Salmonella </em>Typhimurium, which generates disease in mammals, and <em>Salmonella bongori</em>, which is associated mainly with cold-blooded animals, particularly reptiles. While the two bacteria share a majority of their approximately 4,000 genes, the focus was on how those shared genes were regulated differently in the human pathogenic variants. “What we found was that <em>Salmonella </em>Typhimurium has a mechanism wired into their genome that shuts down the expression of flagella once it contacts a host cell,” said Coombes, who is part of McMaster’s Institute for Infectious Disease Research. “The flagella are what bacteria make on their surface that allows them to be motile and move around to new places. However, the problem for bacteria in making flagella is that the immune system picks up their presence and reacts to them as a foreign invader.” Researchers were surprised to discover that once the bacteria invaded into a host cell, it quickly turned off the flagella, making it difficult for the immune system to detect and respond. “If you are bacteria expressing lots of flagella, it’s like wearing a neon sign around your neck basically alerting the immune system to your presence,” said Coombes. “Without that alert, it is a lot harder for the host to contain the bacteria’s spread to more cells.” [caption id="attachment_72790" align="alignright" width="2048"]<img class="size-full wp-image-72790" src="http://brighterworld.mcmaster.ca/wp-content/uploads/sites/2/2018/10/20180724-111319-McMaster-University-Brian-Coombes-0830.jpg" alt="" width="2048" height="1365" /> Brian Coombes in his lab at McMaster University. [/caption] <em>Salmonella </em>Typhimurium is disease-causing bacteria predominately found in the intestine. The Coombes lab puts a focus on the bacteria for good reason. “While people may have experienced gastrointestinal issues because of <em>Salmonella</em>, these bacteria can be drug resistant and in some cases, become difficult to treat,” said Coombes. 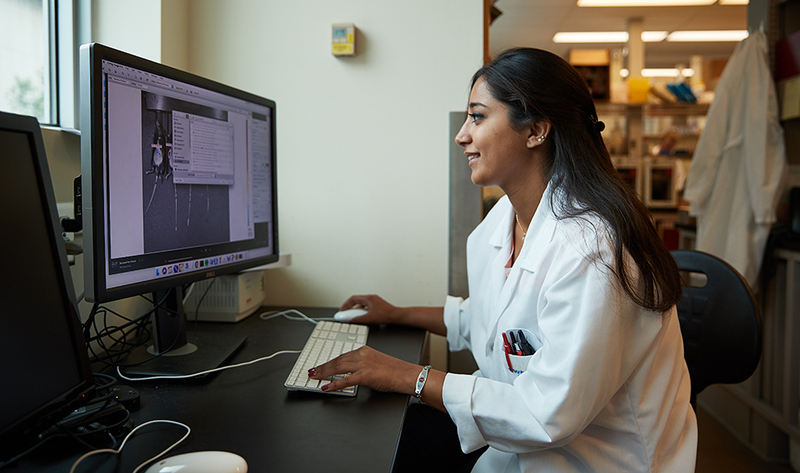 “One of the more worrisome things we are seeing is strains of <em>Salmonella </em>Typhimurium that can cause invasive infections that spread throughout the body.” The Coombes lab is building on these findings by searching for new ways to bolster the immune system. 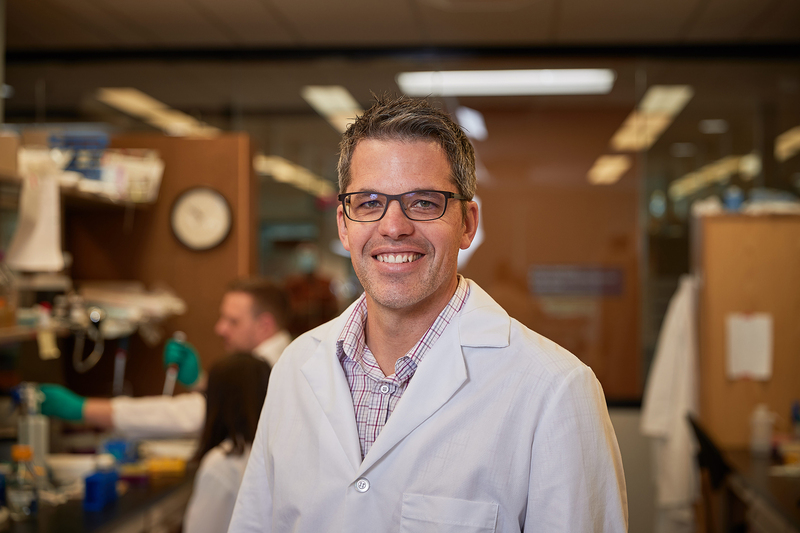 Coombes noted that understanding how bacteria become harmful assists McMaster University’s research focus on helping address the looming antibiotic resistance crisis. “This research is important because it opens up new targets for drug discovery,” he said. “If we can figure out the mechanism of how <em>Salmonella</em> shuts down flagella, and if we can figure out how to reverse that, we can boost the immune system. The immune system will do what it’s naturally evolved to do, which is detect the presence of the bacteria and gain the upper hand.” Coombes credits the biochemistry graduate students and postdoctoral fellows in his lab for their significant contribution to this breakthrough. “We don’t discover anything without our students and postdocs,” he said. “They are the future leaders in the fight against antibiotic resistance.” Funding for the research came from the Canadian Institutes of Health Research (CIHR) and the Boris Family Fund for Health Research Excellence. Read the paper <a href="https://www.cell.com/cell-reports/fulltext/S2211-1247(18)31538-9">here</a>. Read the Brighter World profile on researcher Brian Coombes <a href="https://brighterworld.mcmaster.ca/articles/searching-for-answers-in-the-fight-against-drug-resistant-infections/">here</a>.